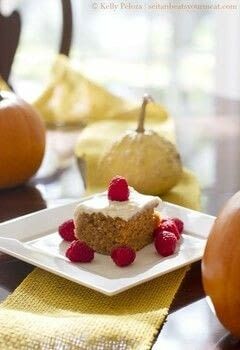 This cake is inspired my my grandma's version of pumpkin cake. Preheat oven to 325°F. Stir together pumpkin, oil, sugar, milk, and vanilla extract. Sift in the flour, baking powder and soda, cinnamon, and salt. Mix until just combined. Pour batter into a 9×13-inch baking pan sprayed with cooking spray or coated with oil.Bake for 30-40 minutes, or until the center of the cake is firm and fully cooked (test with a toothpick, if necessary). Let the cake cool. While the cake is cooling, make the frosting. Whip together the cream cheese and margarine in a stand mixer or large mixing bowl. Add 2 1/2 cups powdered sugar and vanilla, and beat until smooth. Add an additional 1/2 cup powdered sugar if the frosting is runny. It should be a little drippy, but not liquid. Frost the cooled cake. Store in the refrigerator.